Search engine optimization can seem pretty overwhelming, and hiring a company that specializes in this practice will save you a lot of nerves and will probably be a good way to spend your advertising money. That being said, there’s no shortage of SEO companies out there swearing they can get you first page results in no time. How can you know which ones deliver and which are inflating their resumes? Knowing what questions to ask before hiring certainly helps. Here are some things to look for if you’d like to get the most out of working with an SEO company. Are we signing a contract, and if so, for how long? In general, SEO companies work under a contract that can last from 3-6 months to a year – some might even offer contract-free work, although these will rarely deliver comparable results. If your SEO company is offering a 3-month contract, great – if not, you can consider signing one for 6 months as long as you’ve done your research on them. What kind of results can I expect by contract end? This is incredibly important – you don’t want your SEO company forcing you into another contract by saying they just started their work. A professional SEO company will be able to tell you exactly what you can expect when the contract runs out, be it in 3, 6 or 12 months – failure to do so should raise red flags and make you question their merit. In fact, don’t hesitate to ask about the exact search placement and type of backlinks that they plan on delivering, as skilled SEO professionals should have a good idea of what they can accomplish right away. Will I get detailed, real-time updates? Can never have enough transparency – no proper SEO company will hesitate to present you with real-time updates detailing their progress and the results they’re getting. SEO practices can seem difficult and convoluted, but they’re hardly forbidden knowledge, so there’s no reason why the SEO company wouldn’t offer you a step-by-step of what they’re doing and how it affects your business. Can you tell me more about the people who will be working on my site? This is another big one that not all website owners think about. Just because a SEO company has one expert doesn’t guarantee that the rest of their employees will be similarly knowledgeable. To avoid the SEO company placing unexperienced or unskilled workers at the helm of your site, make sure you know exactly who will work on it and the resume they bring to the table. Can you tell me more about your current clients? Big name clients are a plus, but they’re not what you should be looking for. Instead, ask how long they’ve been in business with their current clients. Is the SEO company working with multiple businesses for longer than a year? This could be indicative of a high level of customer satisfaction – whether businesses are working with the company after their first contract expired is definitely something you want to know. Likewise, a SEO company with no current clients older than 3-6 months might not deliver on their promises as much as you’d like. Nowadays, more and more people use the internet almost exclusively through a mobile device as opposed to a PC or even a laptop. Thanks to ever-increasing mass production, smartphones have seen their costs reduced incredibly low without sacrificing much in terms of quality. Everyone has a smartphone these days, and it’s more than likely that they also have a mobile internet connection to check their Facebook and perform Google searches. Consequently, the latter is how your business will get much of its traffic – depending on individual stats, your website could already be accessed through mobile devices a lot more than through computers and laptops. Regardless of whether it’s already there, you’ll definitely want to optimize your business site so that it caters to mobile visitors no matter their type of device. It’s not just about offering more convenience to potential customers – Google now includes mobile optimization as a fairly significant factor when deciding where to rank a website. That’s right: people will find your website more easily if you went through the effort of mobilizing it. So how can you put wheels on your static website? First off, you’ll have to decide whether to have a high-bandwidth site AND a mobile one or simply a one-size-fits-all edition. The former could be called better: visitors of the regular site get more content while those opening the mobile one are treated to something tailored to their connection and device. Of course, having two websites requires a lot more work even with modern website tools that seemingly put you a few clicks away from anything. Having your website detect the visitor’s device and use it to decide which version of the site should be served might sound overly complex or downright off-putting. Don’t worry – a single mobile-optimized website can work just as well in a lot of cases while costing you a lot less effort. When mobilizing your website, make sure to cater to every kind of bandwidth. The landing page can be low-size with light images and no videos but also include pathways to heavier content that can be seen on-demand by those with the right connection. If your landing page or one of the main pages is full of multi-megabyte images and autoplaying videos, Google won’t like you, and your visitors might share the sentiment. As for the design, fitting a website to a smaller screen is difficult but doable. On one hand, you want your pages to be as narrow as possible – your visitors will already be scrolling downwards, so it’s probably not a good idea to make them scroll sideways as well. Likewise, the downwards scrolling should be limited and not cause thumb cramps for those wanting to read through the entire page. Try to work with an editor who can downsize your website text so that it says more while using less space. Likewise, try to keep it as simple as possible – widgets and similar fancy features rarely work well on mobile devices and can cause them to freeze. The same goes for Flash – while adding stylish Flash features to your site might seem like a good idea, there are plenty of mobile devices out there that are too slow to properly render Flash or might not support it at all, so eliminating it altogether might not be such a bad idea. Marketers oftentimes make for good business owner for one simple reason: marketing is what much of the day-to-day of owning a business is all about. If you can’t market your business properly, prepare to be swallowed up by the competition as similar businesses in the area will take every bit of work from you that they can. Don’t worry, though – these days, there are more ways to effectively market a business than ever. Here are 3 examples – take your pick or apply all 3, but be sure to continue experimenting and looking for new and more creative ways. #1 Online marketing: Internet is, without a doubt, the biggest game-changer in marketing in recent years. While the marketing methods of old still do a good job of clinging to relevance, nearly every marketing effort of present day focuses on online advertising and reaching customers through the world wide web. If you’re looking for a place to start marketing, the internet is definitely a good choice and there’s no shortage of ways to do it: Google ads, Facebook ads, Yelp ads, YouTube, newsletters… These are just some methods that can propel your business to new heights when done right or, alternatively, end up not doing much other than costing you a pretty penny. Online advertising starts out pretty cheap and can reach some costly heights depending on the amount of competition in your area, so make sure to plan your budget before starting a campaign. 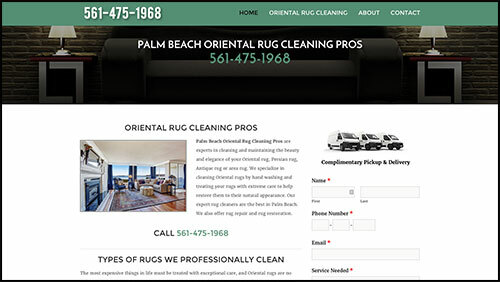 Here’s one of my clients, Palm Beach Oriental Rug Cleaning Pros. It has been a great experience working with this business. #2 Mailers: Mailbox advertising always gave a mixed bag of results, and things are no different now. It’s a fairly hit-or-miss method (or, more precisely, hit-and-miss) – one person could abhor ads in his mailbox while the neighbor-next-door could love them for their convenience. When using mailers to market your business, you’ll have to bite the bullet and deal with the fact that some people won’t like you using their mailbox to sell your brand. To sway public opinion in your favor, consider adding some perks to your mail ads instead of just showing off what you’re selling – coupons, for example, are a tried-and-true way of getting people to appreciate mail ads. #3 Magazines: If you’ve ever read magazines, you know that they can be littered with ads to varying degrees. You might have found these ads funny or insightful, or you might have hated them for the extra page-turning hassle they put you through – the difference likely comes down to how creative and thought-out the advertising campaign was. Let’s get one thing out of the way: print isn’t nearly as popular as it once was, and magazine advertising is a far cry from guaranteed results. This is definitely an issue considering the fee that some mags ask for in order to show your ads, but it’s also an issue you might have to learn to work around if you’re looking to reach as wide of an audience as possible. If you’re using magazine advertising, give special thought to the demographic reading the magazine in question and how attractive your product might be to them. Digital business, will Uber put limo rentals out of business? In with the new and out with the old – isn’t that what they say? Well, Uber is one example of new technology that’s quickly looking to make old ways obsolete (and the lives of those who adhere to them more difficult). Sure enough, Uber is a plenty convenient – not to say revolutionary – way of getting a cab or a similar type of transportation. But is it really a good idea to have it replace standard cabbies and limo companies, and will it do so any time soon? Hearing about Uber for the first time must leave everyone thinking it sounds great (except cabbies, that is) – an app that needs only an internet connection to basically eliminate the hassle of getting transportation. You fire up your smartphone, check for the nearest taxi and call upon it – you can even watch it on the map as it makes its way to you. Yet there are a few reasons why people might want to reconsider using Uber despite its convenience. For one, it forces taxi drivers to work under a governing body that takes a cut of their profits for doing essentially nothing – that can’t be nice to think about if you’re a driver. And while it eliminates the occurrence of scamming on both the driver’s and customer’s parts, it also severely limits the options of taxi drivers running their own transportation business. Yet there is one type of transportation service that can fight Uber with a bit of effort: limo companies. If owners of limo companies stay vigilant, the app isn’t going to drive them out of business no matter how popular it gets. Why? 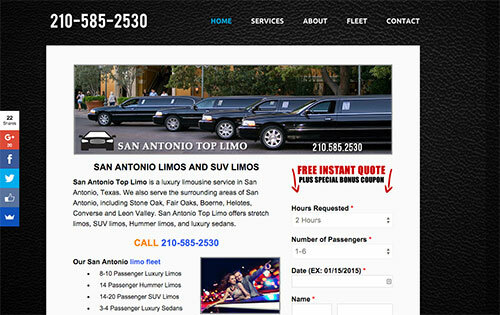 Simple: limo companies can always aim to offer a more exclusive service than any similar company available on Uber. Sometimes, customers want to treat themselves by forgoing a taxi in favor of something slicker and more expensive – at other times, they need a limousine to look good for a big meeting or a similar event where they want to dress to impress. As a limo company, these are the clients you need to be focusing on as Uber’s shadow threatens to consume you. If you’re having trouble finding work as a limo driver in an Uber-ruled area, have you thought about getting a nicer ride? One of the biggest selling points of limo companies is that the Average Joe can ride in a prestigious vehicle that he might otherwise never get a chance to enter – if you’re scrapped for work, perhaps a newer limousine model with a more-attractive exterior could help a lot. Sure, it’s an investment, but you can’t afford to slack in the business world in this day and age. Likewise, limo company owners should make sure that their drivers are better described with the word ‘chauffeur’ – properly dressed and treating each customer like royalty. These are the things that make a difference – things that Uber isn’t able to compete with so easily, and therefore things that can guarantee success for a limo company no matter how many Facebook likes Uber gets. Getting the pages and posts cooking and ready to launch!